Fleming, Ann Marie, “Text for You Take Care Now,” pp. 10-13. Goldberg, Gary, “Script, Production Notes, and Drawings for Plates,” pp. 14-17. Janetzko, Christoph and Dorothee Wenner, “Storyboards for Hollywood Killed Me,” pp. 18-23. Jost, Jon, “Notes for Slow Moves,” pp.25-29. Kobland, Ken, “Storyboards, Plans, and Notes for Frame and Flaubert Dreams of Travel,” pp. 31-35. Moritsugu, Jon, “Plans for Der Elvis,” pp. 37-41. O’Neill, Pat, “Notes for Water and Power,” pp. 43-49. Rainer, Yvonne, “Script Pages and Production Notes for Privilege,” pp. 50-55. Rudavsky, Ondrej, “Ideas for The Wall or The Bridge,” pp. 56-57. Sachs, Lynne, “Script, Pages, Storyboards, and Artwork from The House of Science: A Museum of False Facts,” pp. 58-61. Sternberg, Barbara, “Editing and Script Notes for A Trilogy and The Waters are the Beginning and End of All Things,” pp. 63-65. 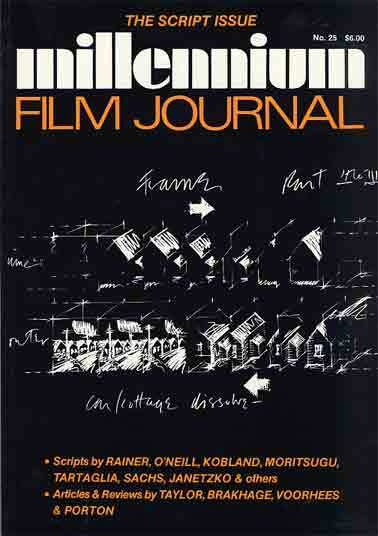 Tartaglia, Jerry, “The Making of Fin de Siecle (1989): A Film Journal,”pp. 66-71. Wagner, Sokhi, “Film Photographs,” pp. 72-75. Reisman, David, Obituary for Delphine Seyrig, pp. 76-77. Taylor, Gregory, “Beyond Interpretation: The Lead Shoes as an Abstract Film,” pp. 78-99. Brakhage, Stan, “Gertrude Stein, Meditative Literature, and Film,” pp. 100-107. Voorhees, Barbara Jaspersen, “The Endless Loop of the Human Continuum: Dominic Angerame’s Deconstruction Sight,” pp. 108-13. Porton, Richard, “Review of David James’ Allegories of Cinema,” pp. 114-20.